Browse: Home » 2010 » September » 09 » Bookmarking is over. just licorize it! Bookmarking is over. just licorize it! 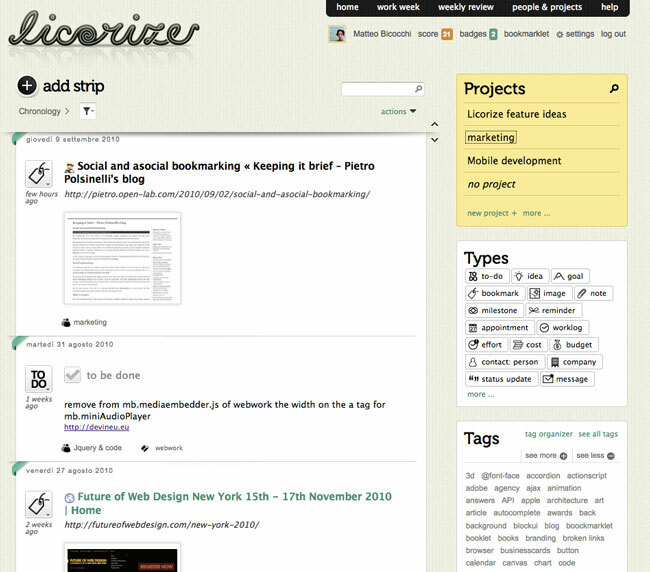 Is Licorize just another bookmarking service? …Not indeed! It’s an innovative experiences collector (now in beta) that lets you turn any web bookmark or status update from twitter® and facebook® into an active part of any shared project you and your team are working on. You can also share ideas, todos, goals, appointments, messages and so on. All that data is then reorganized and tagged into an environment where all project members can see how his team mates are working, what sites they have been to and which tasks have already been completed. Licorize can import bookmarks from your browser and from Delicious®; it has plug-ins for Firefox, Chrome, Safari (The extensions allow you to bookmark URLs, annotate them, or share them with a team) and bookmarklet for all the others… And soon it’ll be integrated with evernote® for a 360° collecting experience. Last but not least it has a super smart interface for an exciting user experience! If you start using it you’ll love it! Licorize site: Give it a try! Did you intentionally mispell Youtube as Yuotube on the http://pupunzi.com/#mb.components/components page?